Upbeat Colorado is a Colorado-based 501(c) 3 non profit organization dedicated to bringing high quality music into places and to people who would not otherwise have this opportunity. Upbeat Colorado offers outreach performances in schools, hospitals, nursing and retirement homes, churches, coffee houses and other public places. Upbeat Colorado provides scholarships and lessons to students from low income families who would otherwise not be able to receive high quality music education. Upbeat Colorado is a Colorado-based non-profit organization. Your contribution is tax-deductible. * Sunday, October 2nd, 2016: House concert fundraiser. 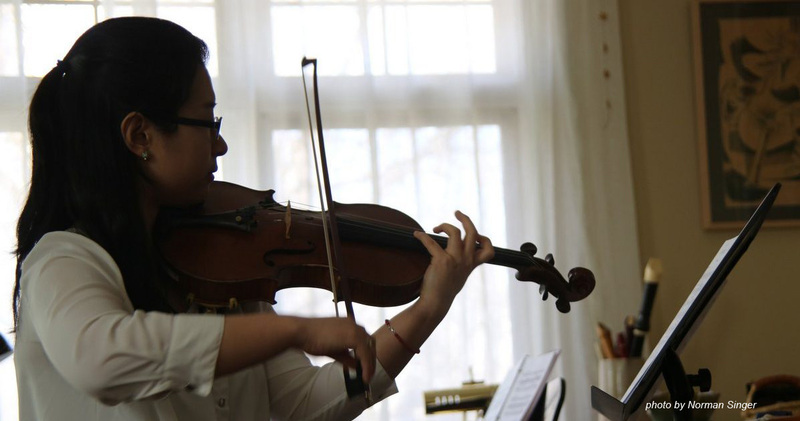 *February 21st, 2016: House concert, featuring guest soloist Yi Zhao, assistant concertmaster of the Colorado Symphony Orchestra. * February 28th, 2016: Young People’s Concert at Cameron United Methodist Church. “The Story of Babar.” As part of Downtown Aurora Visual Arts (DAVA) Youth’s Fashion Forward exhibition, Apple Pie presented “The Story of Babar”. It was a part of the opening events that were offered that evening and was open to public free of charge. Babar the Elephant is a very popular French children’s fictional character who first appeared in Histoire de Babar by Jean de Brunhoff in 1931 and enjoyed immediate success. An English language version, entitled The Story of Babar, appeared in 1933 in Britain and also in the United States. The book is based on a tale that Brunhoff’s wife, Cecile, had invented for their children. It tells of a young elephant called Babar who leaves the jungle, visits a big city, and returns to bring the benefits of civilization to his fellow elephants. Then he comes back and becomes king of the kingdom. He then has children and teaches them valuable lessons. Apple Pie has presented this highly interactive program narrated by Shana Kirk and piano music by the French composer Francis Poulenc, performed by Carol Rankin at numerous children’s events.